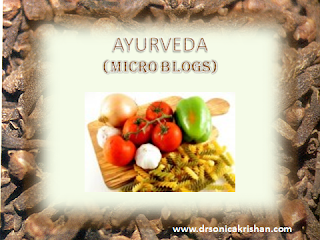 How Ayurvedic Diet Tips For Weight Loss Help? Ayurvedic diet intended for combating obesity and enhancing the weight loss would more importantly relieve the body of build up Ama (Toxic matter / undigested food) and at the same time would invigorate the Agni (Gastric fire). A proper digestion and metabolism helps in building healthy tissues in our body. Anything else that does not get digested too well, tends to create toxins and fat, which leads to an obvious weight gain. Try and involve yourself in some kind of physical activity – basically, anything that you enjoy and makes you break a sweat. You can also do some yoga. Also, as stress / depression has been believed to be one of the major causes of weight gain, try taking our few minutes for some meditation every day go a long way in achieving peace of mind. Ayurvedic diet for weight loss suggests taking a spoon of Triphala with a warm glass of water or milk every night. It helps a great deal in detoxifying and strengthening our body. Heaviest meal definitely should be consumed during lunch, and dinner must be the lightest. Also, never skip a meal – especially your breakfast. You need to avoid any kind of fizzy drinks or any other beverage that is too cold or contains preservatives or added sugar. Also, consuming chilled beverages with warm food weakens our agni, or our digestive fire and may lead to bloating and discomfort and you must never go on crash diets.